Below is a direct transcript of the above video. "Backups have become very important because its your recover point and actually malware is the biggest cause of us needing to restore files. You get hit with a ransomware and it encrypts all the data on your drive, the process of recovering is not paying ransom to the person that encrypted your drive that’s only about 25% effective, it's really about going back to the backup. In the early days it was about backing up once a night. We’ve since evolved so we can do something called continuous backup. What is the right amount of backup for a customer? It depends on this concept of recovery point objective and recovery time objective. Those are the two things that are most important when it comes to determining how often you backup and how often you should backup. Recovery point objective is how much data you can afford to lose, so for example if your backing up once a night, by default your saying you recovery point objective is 24 hours. For example: if your data were to be corrupted at 23 hours 59 minutes from the last backup you’ve lost 23 hours 59 minutes because your backup is once every 24 hours. Some don’t have the tolerance for that, so they back up once an hour or every couple of hours or something within a much shorter time frame. Recovery time objective is very important for small businesses owners and individuals using carbon copy or one of those type services. Recovery time objective is how long would it take to get your data back? You’ve spent the last two years backing up to Carbon Copy wherever they are, and you’ve backed up 2 terabytes of data over your DSL line. You’ve spent two years backing that up, you’ve accumulated a lot of data. It may take them a week or two to get that data back over that same straw of a pipe internet pipe to your system. That recovery time objective is very important, how soon can you get your data back. A good backup includes both a local component and an off-site component. You’re backing the data up locally then its transmitted off site to a secure cloud backup. If your building does burn down, you can get your data back. Its good to have a local component because you don’t have to wait for your data to come back from an off-site location in order to restore from. The best practice is to make sure people in the office are saving their data on the server not on their local PC’s. Servers are what’s being backed up not the PC’s. The obvious exception to this is a laptop where somebody needs some data on their laptop because they are getting ready to travel and going to be on a plane they need to work on a document on a plane, that data is now outside the protection of your backup. What we are encouraging our customer to do now is use Microsoft’s “OneDrive” and redirect their “My Documents” folder and personal folders into “OneDrive” and let “OneDrive's” data centers back critical data up. The answer is kind of a part “A” and part “B” for data in the office, for desktops store it in the server. Server gets backed up and it is stored off site. For laptops and traveling users use “OneDrive” or something similar to it such as Google Drive. You’ve set up your backup, and you’ve got it on auto-pilot and its backing up how often do you check it? How often do you test restore from it? How often do you make sure it’s working? I can’t tell you over the years how many times people have thought the backup was working, and they’d gone a month, and nothing had happened. Something has hung up or the backup job was failing. They go to restore and realize the most recent good data is a month or two old. We test our backup daily, we do random restores off our data to client sites. We let them tell us what file they want to test. 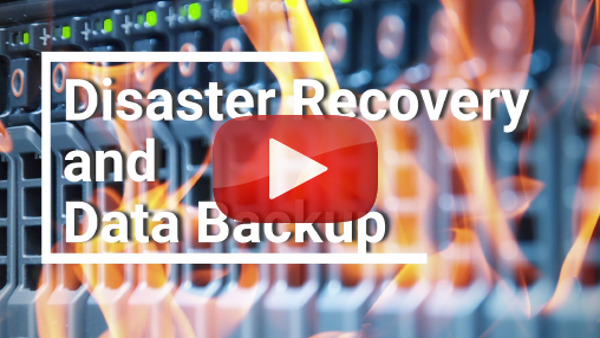 We do a lot of things to ensure, not only the backup job is being monitored but the errors are being remediated, and we are doing test restores on a very regular basis. We make sure that what we think we’re backing up, is actually being backed up, and not only that the backups are actually good. Later on this month we will be putting forth a similar blog tailored to Law Firm tech support backups and Healthcare tech support backups with advice on regulation compliance. Want more? Here are a few more articles you can check out. Public vs. Private Cloud: Which is better?